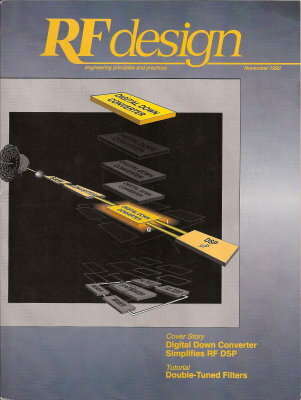 Way...... back in 1992, RF Design magazine ran a software contest. Those were the days when most engineers and hobbyists wrote software in either Basic or Fortran. I happened to use Turbo Pascal, by Borland. At the time, I was working as an RF engineer for Comsat, in Germantown, Maryland. Having done a lot of frequency conversion designs in my previous work at General Electric, and even more there at Comsat, I had already written a crude program to calculate mixer spurious products, so this challenge gave me the excuse I needed to refine the user interface and add some creature comfort features like loadable mixer spur files and detection of spectral inversion if present. Although I did not win the grand prize, I did win the runner-up prize (along with, I think, a couple other people). The prizes included having the following article published in the November 1992 edition of the magazine, a couple experimenter kits of surface mount inductors and resistors, a T-shirt (which I still have), and a couple other items. Of course, the greatest prize as far was I was concerned was having an article published in a major magazine. Sadly, I do not even own a copy of the program any more, or I would make it available for download. RF Design distributed it, so if anyone happens to have a copy and would send it to me, I will post it for download. Here is a scanned and OCRed version of the article that appeared in the November 1992 edition of "RF Design." SPURS is the evolution of a program written originally to provide a simple means of determining spur products. However, as the program was used both by the author and his fellow engineers, it became clear that some user-friendliness would be a nice addition. Over the years much has been incorporated in the form of error trapping, input and output display screen format, file handling, and on-line help screens. be analyzed. SPURS performs a single-conversion, single-tone analysis of mixer spurious products using parameters entered in the input parameter screen. Spurious products will be calculated according to jLO ± kRF and kRF ± jLO, where j and k are integers for harmonics entered in the Highest Harmonic input lines. Spurs that fall within the specified output filter bandwidth will be displayed and recorded. In order to facilitate choosing a fixed LO frequency or variable frequency range, SPURS calculates the low-side and high-side LO center frequencies that translate the center of the input frequency range to the center of the output frequency range. cutoff frequencies of the filters, center frequency and bandwidth or low and high cutoff frequencies. Figure 1 shows the input parameter screen when the center frequency and bandwidth input format is used along with a fixed frequency LO. Input Frequency and RF are used interchangeably throughout this document. The use of the term RF is avoided for the input frequency since in the case of an up converter the output may be considered the RF. However, in the output spur table and in the mixer spur level files, RF is used to designate the harmonic number since doing so conforms to industry standards. Frequency units (Hz, kHz, MHz, etc.) must be kept constant. Six places are provided for frequency inputs in order to allow a span of nine decades between the lowermost and uppermost frequencies with at least a two place accuracy. Figure 2. Examples of mixers exhibiting inversion and no inversion. Figure 1. SPURS input screen. Center frequency/BW and fixed LO specifications have been made. output. In the case of a dual conversion, two inversions will result in a non-inverted output. Some applications can tolerate frequency inversion; however, voice systems with an inversion result in unintelligible information. SPURS tests for inversion and reports the result to the screen and, if selected, to the printer or disk file. Two types of local oscillators (LO) may be chosen: fixed and variable. If a fixed LO is chosen, that LO frequency will remain fixed while the input frequency is swept in accordance with the chosen number of steps. If a variable LO is chosen, the variable LO will step from the low frequency to the high frequency using a number of steps designated by the user. Computation time increases over the fixed LO case by a factor equal to the number of LO steps + 1. Spurious products will be calculated according to jLO ± kRF and kRF ± jLO, where j and k are integers for harmonics entered in the Highest Harmonic input lines. Spurs that fall within the specified output filter band will be displayed and recorded. In order to avoid an unnecessarily long list of inband spur products, the 1 xi spurs are not recorded. If at least one occurrence is encountered, then the appropriate "X", "Y", or "Z" is displayed in the output spur table and a note is made in the output file. Frequency inversion must be considered when choosing the LO frequency. Enter values for the highest harmonics to be used when calculating the spurious product frequencies. The largest spur order to be calculated will equal the highest RF harmonic added to the highest LO harmonic. Separate values are allowed for the two highest harmonics since computation time and the size of the spur product file are highly dependent on both values. Many times high order LO harmonics are more important due to leakage of the usually higher input power of the LO (+13 dB or more greater than maximum RF, typically). The output spur table will display those products which are generated by the mixing process from 0 to the highest harmonic values entered. The zeroth harmonic represents the DC (direct current) component, if any. Calculation time and the output spur list can be shortened by choosing the lowest harmonic necessary to achieve the required mixer spurious suppression. Figure 3. SPURS output screen. For instance, if all RF harmonic spurs above the 5th and all LO harmonic spurs above the 7th are suppressed below the system requirement, then test only for up through the 5th RF harmonic and the 7th LO harmonic. Frequency steps are usually easier to visualize without a calculator when the input and output frequencies are entered in the center frequency and bandwidth form. For example, a bandwidth of 9 MHz (see above example) with a number of steps of 9 results in a 1 MHz step size. which the levels are valid, as specified in CURRENT.MXR. Conversion loss is not accounted for in the level unless accounted for in CURRENT.MXR. Figure 3 is the output screen spur table in the X, Y, and Z format. Upon quitting the program you may review the results with a standard text editor or viewer. Along with the spurious information, at the beginning of the file the file name, time, and date plus all of the input parameter data is saved. The desired spurious product usually occurs for j = 1 and k = 1; therefore, since it occurs most often it is not included in the output spur list. However, if it does occur at least one time, the appropriate "X", "Y", or "Z" is displayed in the output screen spur table and a statement is inserted into the output hard copy or disk file. Figure 4 shows the format. The output file format is convenient for importing into other programs for post-processing such as graphing. highest RF harmonic tested will be the 5th and the highest LO harmonic tested will be the 7th. Figure 4. SPURS output file format. Figure 5. An example mixer spur level file. entered in CURRENT.MXR. As can be seen in Figure 3, only the 3l0-4RF spur falls inband with a level of -66 dBc. This selection of LO frequency and the mixer selection appears fine. A basic requirement is that no intolerable spurs be generated from within the input frequency band since no amount of filtering can get rid of them. However, since the real-life filters are not ideal, further investigation must be made to assure that out-of-band RF input signals cannot generate intolerable spurs within the IF output ripple bandwidth and that inband RF input signals cannot generate intolerable spurs in the IF output outside of the specified ripple bandwidth. The system specification calls out maximum sigal powers for bandwidths out to 40 MHz. By widening the input filter to a 25 MHz bandwidth and re-running SPURS, it will be found that no new spurs fall inband. It will be noted, however, that the out-of-band input frequencies cause the same 3l0-4RF spurs. Since out-of-band input signals experience additional attenuation by the real-world input filter, there is no cause for concern about I those spurs (provided that the out-of-band signal is no higher in amplitude than the input signal). Next, we widen the input filter further to 40 MHz and re-run SPURS. The output spur table now reveals the additional presence of 0LO x 3RF (-51 dBc) and 5RF-1LO (-59 dBc) spurs. Pressing F8 displays the spur list. From here, we can determine at which frequencies the new spurs are caused and, knowing the real-world filter rejection at those frequencies, determine whether or not a problem exists. The 0LO x 3RF spurs occur for input frequencies ranging from 164.00 MHz to 170.00 MHz. 164.00 MHz corresponds to the 28.0 MHz bandwidth. Although 164.00 MHz is presented as the lowest input frequency for which 0LO x 3RF spur falls inband, in reality the lowest input frequency would be 490/3 = 163.33 MHz. Using a larger number of steps would have included 163.33 MHz in the output spur list. The important point is that the number of steps chosen did indicate all possible types of inband spurious products. If the real-world input filter provides at least (60 - 51) dB = 9 dB of rejection at 163.33 MHz, then no problem exists. Input frequencies above 163.33 MHz will be attenuated even more if the filter is monotonic (no inflection) in that region of the stopband. The 5RF-1 LO spurs are generated at input frequencies from 168.00 MHz to 170.00 MHz. 168.00 MHz corresponds to the 36.0 MHz bandwidth. Similarly, if the input filter provides at least (60 - 59) dB = 1 dB of attenuation at 168.00 MHz, then all is fine. In fact, if the filter passes for the criterion of the previous paragraph, then it automatically passes for this criterion since 168.00 MHz is deeper into the stopband. Spurious product levels must now be checked throughout the full specified output band. To do so, SPURS is run again with the input filter set to a 40 MHz bandwidth while the output filter is first set for 480 MHz to 490 MHz, and then for 510 MHz to 520 MHz. Since the output inband spurs have already been to be of no consequence, including the center 20 MHz frequencies in the final analysis would only make the output spur list longer and more difficult to interpret. Running SPURS once for the lower band and once for the upper band makes more sense. Running SPURS for the lower side of the output band to the 40 MHz bandwidth results in the 0LO x 3RF (-51 dBc), 5RF-1 LO (-59 dBc), and the 310 - 4RF (-66 dBc) spurs showing up. Since they all are less than the required -50 dBc, output filtering for the low side is good regardless of the input filter rejection. Finally, running SPURS for the upper side of the output band to the 40 MHz bandwidth results in the 0LO x 3RF (-51 dBc), 0LO x 4RF (-73 dBc), and the 3LO-4RF (-66 dBc) spurs showing up. Since they all are less than the required -50 dBc, output filtering for the high side is good also. This example is a recommended procedure for efficiently using SPURS, but experience has proven that someone else will almost assuredly find a more sensible way to utilize the features of this program. If you discover that better way, the author would appreciate a note, so that your discovery can be passed on. Kirt Blattenberger entered electronics as an Air Force traffic control radar repairman. He mixed work as an electronics technician and school for several years, receiving his BSEE from the University of Vermont in 1989. He can be reached at 13446 Greensburg Road, Smithsburg, MD 21783, or by phone at (301) 824- 2505.